Arsenal will be without one of their most influential players for the whole of March in the aftermath of Saturday's breach of regulations. The Gunners took the lead through Aaron Ramsey in the 16th minute but they could not hold on till the end to earn all three points. In the second half, Harry Kane equalised for Tottenham from the spot following a foul on him by Shkodran Mustafi. That laid doubt on the possibility of Unai Emery's men leaving with a win. 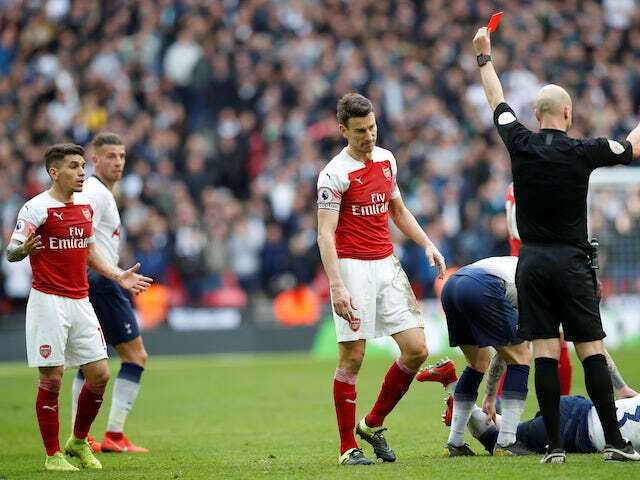 The opportunity to grab the victory came in injury time but the chance was surprisingly blown by Pierre-Emerick Aubameyang as he failed to beat Hugo Lloris. That was so painful. The negatives did not end there. Just few seconds to the end of the match, Lucas Torreira received marching orders for a challenge on Danny Rose. The 23-year-old got the ball. However, he caught the left back on the follow through leaving referee Anthony Taylor with no option than to show him a red card. The Uruguayan international's red card was a somewhat harsh one which could be appealed if the club consider that. It is however not known if that move will be made. Should the club decide to go with the sanction, Torreira will miss Arsenal's next three Premier League games. The first will be against Manchester United by the weekend and with the following league fixture against Wolves already postponed as a result of their involvement in the Emirates FA Cup, there will be no league game for Arsenal for the rest of the month. After United's visit, Arsenal will only a game in the Europa League meaning Torreira will not be involved in the EPL till April. The first two matches which will be with Newcastle United on April Fools Day and Everton six days later will also be missed by Torreira.